Today it was biting cold outside, and with that came the cloud-free heaven. I could see several stars in the heaven and decided to go outside for my first attempt with star photography. To be honest, I did already do my research and over the last months I tried to learn how star photography works with a camera. There have been a couple of things that did hold me back. I am living in a country and city with a lot of light pollution, I know, most of us do today. Apart from that, I thought that the photos wouldn’t be interesting as a city doesn’t give you a lot of opportunities when it comes to landscape shots, but landscape shots do work best with start photography. Setting my kit lens to 18mm and point it somewhere at the horizon would always come with the result that I have some structures, street lights or park trees in the picture. Yeah, I know, maybe I am just not creative enough yet to make use of the good places in the city. Now I reminded myself that photography is not always about getting the greatest results right away, it’s also about learning how to achieve certain shots. Still at home, I did set my lens to 18mm, my camera to 15 seconds shutter speed, high ISO and f/3.5 aperture. Next I packed my tripod into the bag, as same as my camera and went outside. My first goal was to take one of these great milky way shots, because I used a program called Stellarium and researched how that would be possible. But I noticed right away how stupid this idea was, because as said, in a city or district it’s hard to take photos of the horizon if there are a lot of apartment structures in front of you. I didn’t want to get out of the city to do it, now my idea was to simply point my lens somewhere straight up into the sky as I thought a simple stars photo would be enough for my first try with star photography. I thought there are a gazillion of stars out there, so what could go wrong? Above you can see a photo that I shot today. I took several test shots and some of them were really good in my opinion. The picture in this post is actually not too bad I think. I mentioned already the settings that I decided for at home but outside I wanted to try ISO 1600 and ISO 3200 and decide what would give better results. I took several shots and both settings worked nicely but I think ISO 3200 is better and worked well for the photo in this post. But I noticed one problem right away, it was the tripod quick release plate that is attached to my camera. This thing always works great when I use my tripod, but if I point my camera straight up, I noticed that I must be very careful that my camera won’t start to screw out of the thread. Obviously there must be better plates for this type of job. Now let me lose some words about our universe. We all know it’s huge, and even this word is probably not enough to explain how big the universe actually is. So, what I will say next doesn’t mean that I am not aware of how endless the universe appears. Anyway, if you take your first own shot of a small section of it to take a look at it at home on your computer screen, you become even more aware of it. The photo was taken from my standpoint, no, actually our standpoint and it really shows that we are basically just one small particle swimming in large ocean of unknown size. It was really fun to take my first own starry sky photo. We might often think that we are significant, but it brings you back down to earth if you have the much larger scale in your mind, and then we rather appear insignificant. Postscript: Looks like the andromeda galaxy is visible in the lower right corner of the image. It looks like a planet with a ring but I researched and found out that it’s indeed the Andromeda galaxy. The program Stellarium is really a nifty tool, you can add your GPS position and you can even go back in time to research what you have seen in the sky. 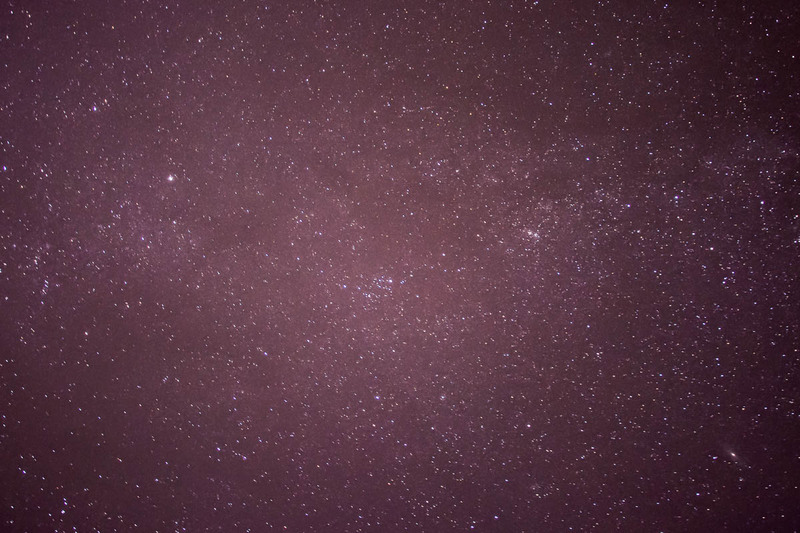 This is how I learned that the Andromeda galaxy is in the lower right corner of my photo! Looking at the stars never disappoints. I moved to Washington state a few years ago and have missed seeing them every night. Clouds persists throughout most nights here. I think your picture came out wonderfully. It is fulfilling to take photo that evokes the feelings you speak of. Haha, I think you might be heading in the expensive new hobby direction! I think it’s awesome, though. Can’t wait to see more! I have the tripod the camera, the lens, and the darkness. I do not have anyplace with a clear view of the sky. Ironic, isn’t it? If you drop the saturation on you photo, it will look more “black” and less red. Actually, processing it in black and white might make the stars “pop” out more. I haven’t tried it myself, but it works with moon shots, so it ought to work with stars, right? I love astronomy. I wish I had some sky to do some of my own. I actually added the red with split toning 🙂 I thought it looked nice as the nebulas become visible. The original tone was more blue. I am in the wrong place too, if I shoot south-western direction, I have full light pollution of Hamburg in the shot as seen in my other post: https://diaryofdennis.com/2016/11/29/orion-nebula-and-orions-belt/ althought it still looked ok in this case. Just take your tripod when you travel. you never know when you’ll have that clear sky waiting for you. I’ve gotten all my good sky pictures (moon, mostly) when I was on vacation somewhere. here, it’s pretty much hopeless.